We are excited to continue finalizing the plans for the 2019 Spring Conference. 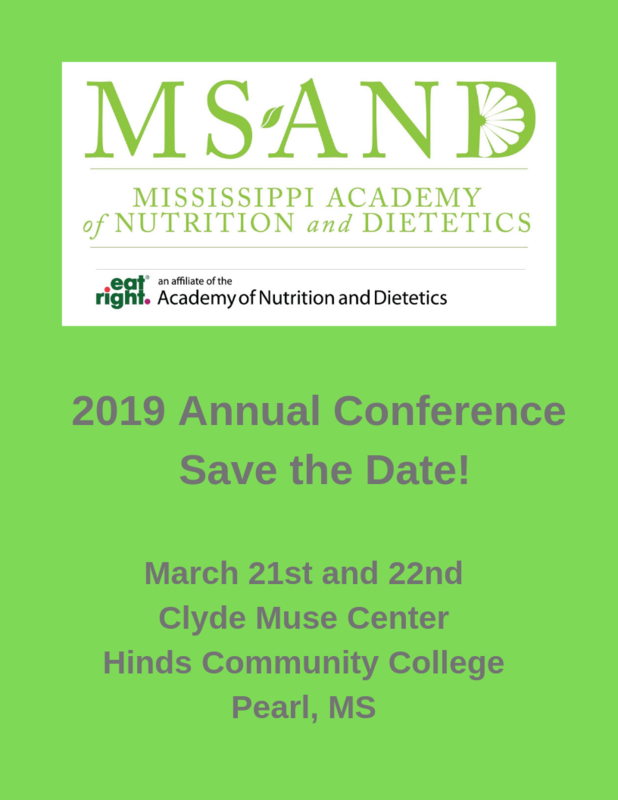 The conference will be held on March 21-22, 2019 at the Clyde Muse Center in Pearl, MS. We will have a full agenda of some very talented speakers and presenters offering a wealth of information on a variety of topics to meet this year’s theme: Expanding Your Horizons. The MS-AND Board of Directors along with numerous other volunteers have worked tirelessly to create a schedule of events that will appeal to all RDNs. We will also be having a reception shortly after the closing session on Thursday March 21st to be held at Table 100 where you will have time to meet and mingle with fellow RDNs while also viewing student poster sessions for 1 hour CEU. All of the scheduled speakers will be invited to attend this reception to help increase our networking opportunities. Please be looking for future email updates and mailings which will include a complete schedule and agenda along with promotional information to enlighten you on the work of our slate of speakers. 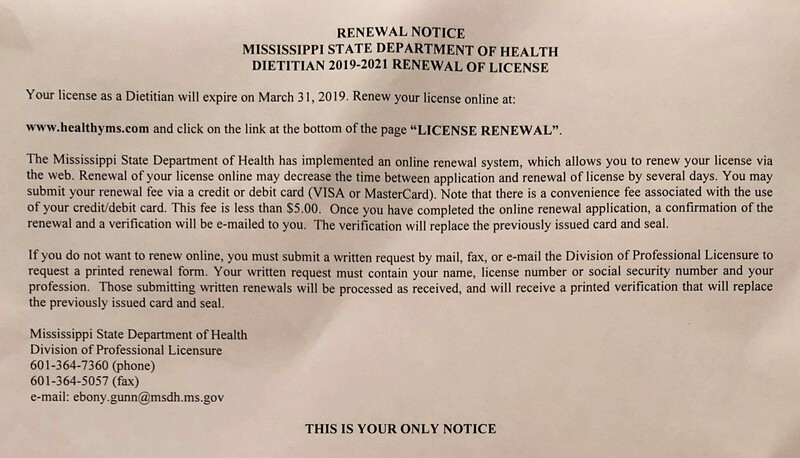 Our Mississippi dietitian license expires March 31, 2019. You will get one notice of renewal from the Mississippi State Department of Health (see image below). If you have moved since your last renewal, and not updated the Mississippi State Department of Health, you will not receive the notice. The easiest way to renew is online by clicking here: https://www.ms.gov/HealthLicensing/Main.do (you can also apply for a license, click here for the pdf: https://msdh.ms.gov/msdhsite/_static/resources/564.pdf). The Mississippi State Department of Health recommends that you renew as soon as possible to avoid last minute complications. The Nominating Committee of the Mississippi Academy of Nutrition and Dietetics (MS-AND) has worked hard to attain a strong set of candidates for the 2019-2020 MS-AND Board of Directors. Our elections will run at the same time as the Academy elections: February 1-15, 2019. The MS-AND ballot and voting instructions for the Mississippi elections will be distributed to the members soon. 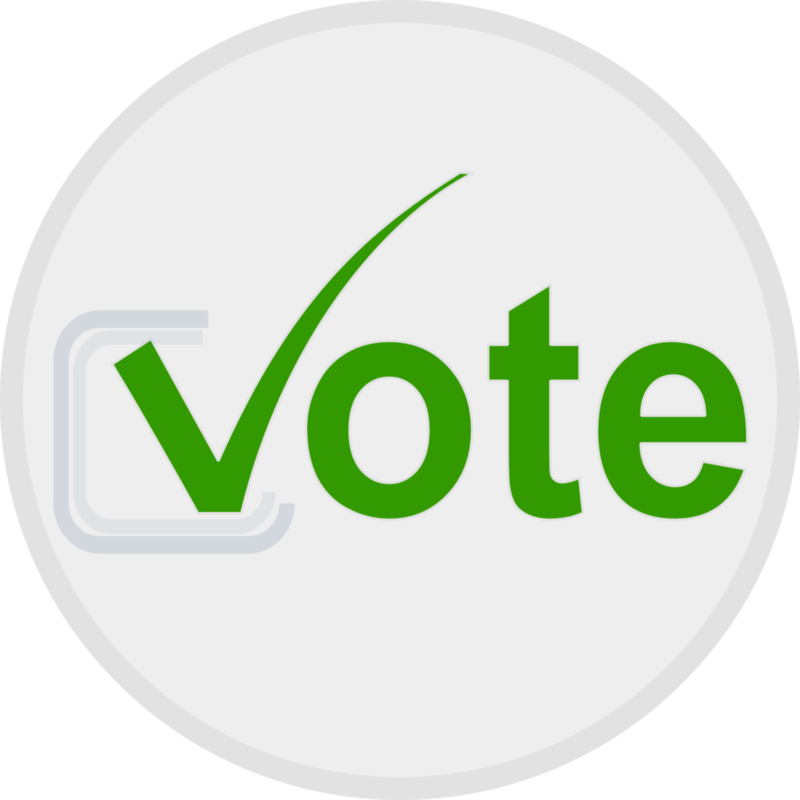 Please take some time to review the national ballot: https://www.eatrightpro.org/leadership/nominations-and-elections/national-election. National Nutrition Month® – How Will You Celebrate? March is National Nutrition Month®! In an effort to support the original purpose of National Nutrition Month®, “to increase the public’s awareness of the importance of good nutrition and position members as the authorities in nutrition”, the campaign will serve as its own theme. This allows the diverse areas in which National Nutrition Month® is celebrated to have more flexibility in the promotion and messages. Be sure to check the National Nutrition Month® website periodically for updated information. There is a National Nutrition Month® Celebration Toolkit with promotional resources such as: web banners, half page ads, press releases, and a PowerPoint presentation. Soon Nutrition Tip sheets, activity handouts, and a social media toolkit will also be available. 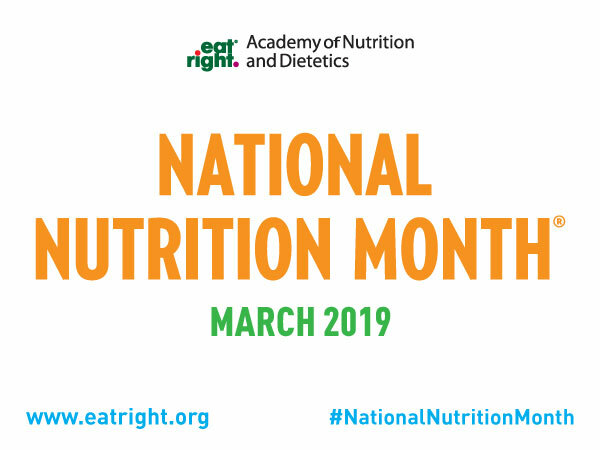 A graphic promoting National Nutrition Month® is available to Academy groups for their websites, newsletters, and signage for events and other activities promoting National Nutrition Month® by filling out this form and sending it to permissions@eatright.org. Registered Dietitian Nutritionist Day will be March 13, 2019. The National Nutrition Month® website also features “Registered Dietitian Nutritionist Day Event Ideas”, and there is a graphic for RDN Day available upon request. There is a National Nutrition Month catalog featuring a variety of items that will add to your celebrations. It is available for download or may be accessed through a link from the National Nutrition Month® website. 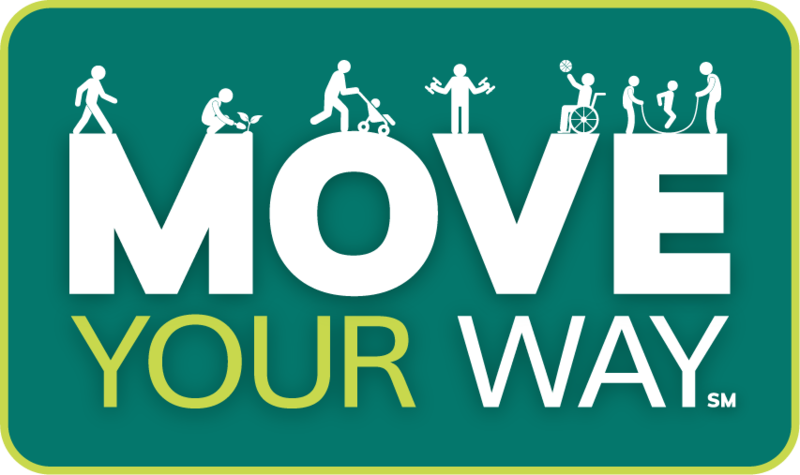 The U.S. Department of Health and Human Services selected Jackson, Mississippi as one of two launch sites for the 2nd edition of the Physical Activity Guidelines for Americans and the Move Your Way Campaign (https://health.gov/moveyourway/). The official launch in Jackson will be February 9, 2018 at the Jackson Medical Mall with a “Try-A-Thon – Try What Works for You” event. Participants will be able to try a variety of different activities throughout the event. The MS-AND Nominating Committee is seeking award nominations for the following awards. Click here to view the awards criteria. Complete the attached Award Descriptions and Nomination Form 2018 and email it to laura.ewoldt@gmail.com, lesliehillhouse@hotmail.com, or Roxanne.kingston@usm.edu by January 31, 2019. On Thursday, April 11th, the Renal RDs of Mississippi will hold their Spring 2019 Conference in Jackson, MS at UMMC. All Renal RDs who practice in the state (or any RDs interested in the renal field) are welcome to attend. Email rbutz@umc.edu to be added to the email communications list regarding this meeting. Nominations will be accepted soon for MS-AND’s Outstanding Student of the Year Award so everyone interested in submitting nominations for this award should be on the lookout for email communications soon regarding criteria, eligibility, selection process, and deadlines. Delta State University Coordinated Program in Nutrition and Dietetics hosts “Enteral and Parenteral Update” Workshop. The Delta State University Coordinated Program in Nutrition and Dietetics will host a Workshop: Enteral and Parenteral Update on February 13, 2019 from 10 am until 3:00 pm at the Jacob Conference Center in Ewing Hall. All DSU preceptors, alumni, and instructors are invited to attend. CEU’s and lunch will be provided. There is no charge. Speakers for this event are Karen Lewis, MS, RD, LD and Pamela Roberts, MS, LD. RSVP to Ensley Howell at ehowell@deltastate.edu. The 2018-2019 SCAN Dietetic Internship Awards (fiscal year June 1-May 31) will be given out in the Spring of 2019. We will award 5 stipends of $500 to defray expenses associated with dietetic internships such as DICAS, D&D Digital Matching, application fees, tuition, and books. Please complete the SCAN Dietetic Internship Award Instructions and Application Form and submit to SCAN at info@scandpg.org by Friday, January 18, 2019 by 5:00 p.m. CST. An online five-question reference evaluation from a previous faculty member will also be required, please reference the Instruction and Application Form. All SCAN members including students are invited to submit abstracts for the 2019 Symposium Poster Session. Submissions using the official application form only must be sent in to info@scandpg.org on Monday, January 7th, 2019 by 5:00 PM (CST). Abstract acceptance will be based on a peer review process and relevance SCAN’s mission. Research abstracts contain a brief description of author’s original research, methodology, major findings, and conclusions or implications for practice. – I enjoy interacting with the residents and feeling like I contribute to impacting their quality of life. – I love being active. I enjoy running. I have recently signed up for my 5th half marathon. I recently picked up tennis and that is a lot of fun too! – Starkville!! I love the campus, especially the envirmoment during football season on game day.